This is surely something you should learn up, taking only 10 minutes of your time to make (exclude chilling time), and treat your large guest crowd during any party events. This sweet dessert also serves as a cooling treat during the hot weather. You have to serve it chilled! (1) Combine water and corn flour in a pot. Use a small balloon whisk to stir while bring the pot to simmer on medium-low heat. Stir in sugar and evaporated milk. Keep stirring the mixture to avoid sticking to the bottom, until thickened. Texture of the mixture should be thick and with some resistance, feeling viscous. (2) Stir in coconut milk and corn kernel immediately. Then, transfer to a square tin. Smoothen out the surface if it appears uneven (I did not, and so….. my kueh in the pictures doesn’t look pretty). Bring to steam for just 5 minutes. Leave it to cool, and then, store in the refrigerator to further set it for few hours before slicing to serve chilled. 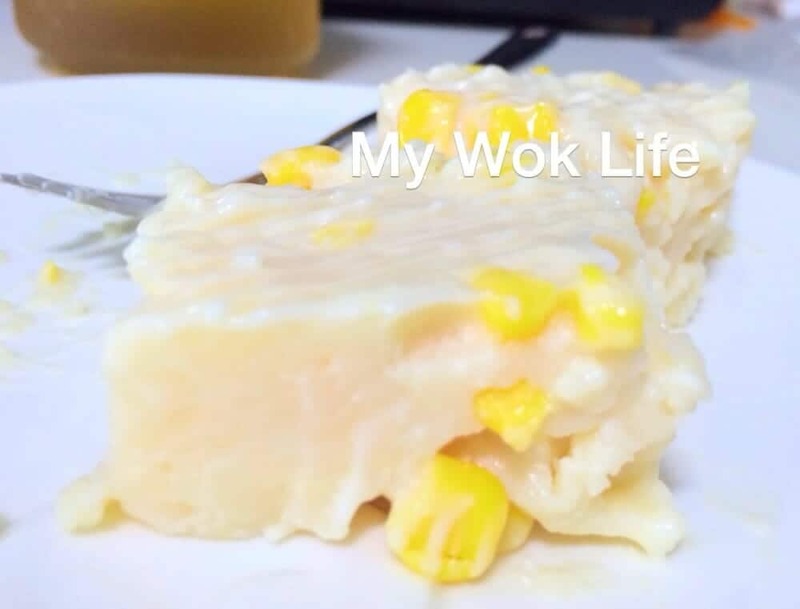 In fact, if the corn flour mixture is simmered until very thick to almost set during the cooking process, and even after mixing in the coconut milk and corn kernel, mixture seems having high viscosity, you may want to skip the steaming part and place the dessert to set in refrigerator once cooled a little. I did that. 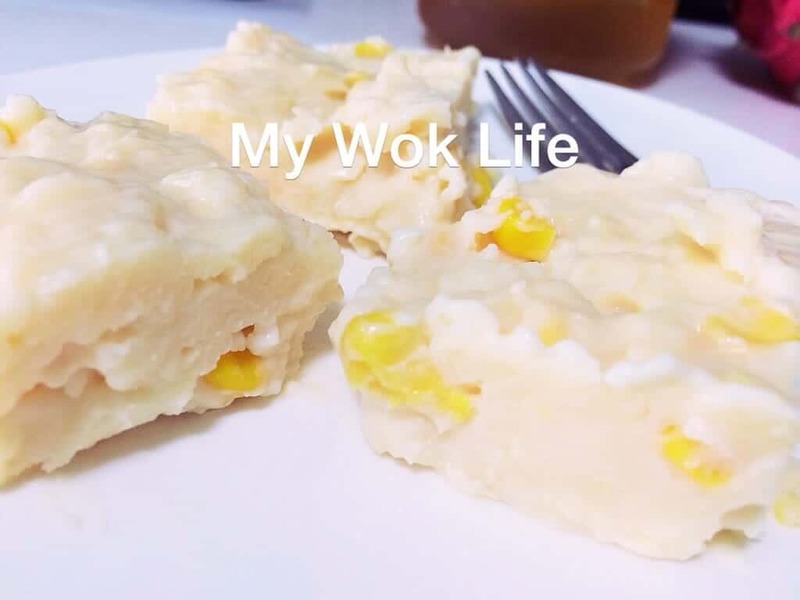 A piece of coconut milk & sweet corn kueh counts about 120kcal. Tips: If you choose not to steam the kueh and it doesn’t set after refrigerated, don’t path row it away. Bring it out to either simmer till set or steam it again. It will still work, and taste wise, no different. * Get the canned corn kernel (without cream) from supermarkets to ease your job. But of course, you may choose to use the fresh corn kernel. Simply boil it until softened before using in this recipe. ** Note that the kueh can be stored in fridge for up to 3 days only. Best to consume within 2 days.